Exhibited in the Da-Chen Gallery in Taipei in 2007, “No. 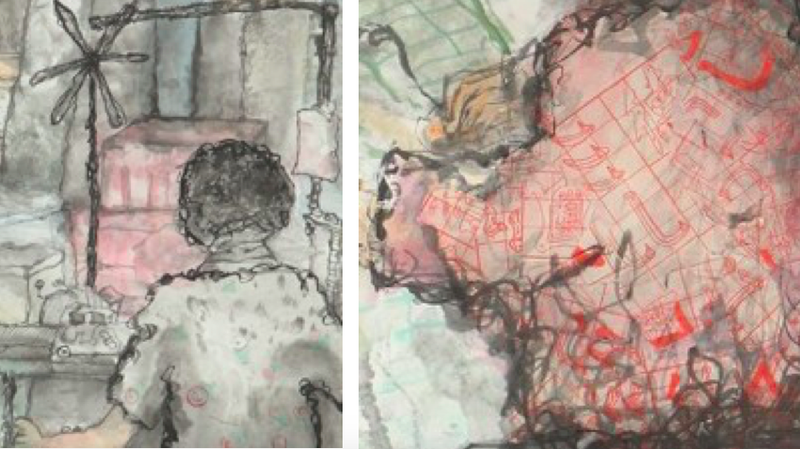 9, Line 73, Chenggong Road” is an ink wash painting illustrating a messy textile factory. It was drawn using Chinese black ink as used in calligraphy, and watercolour on highly absorbent tissue paper stencil. 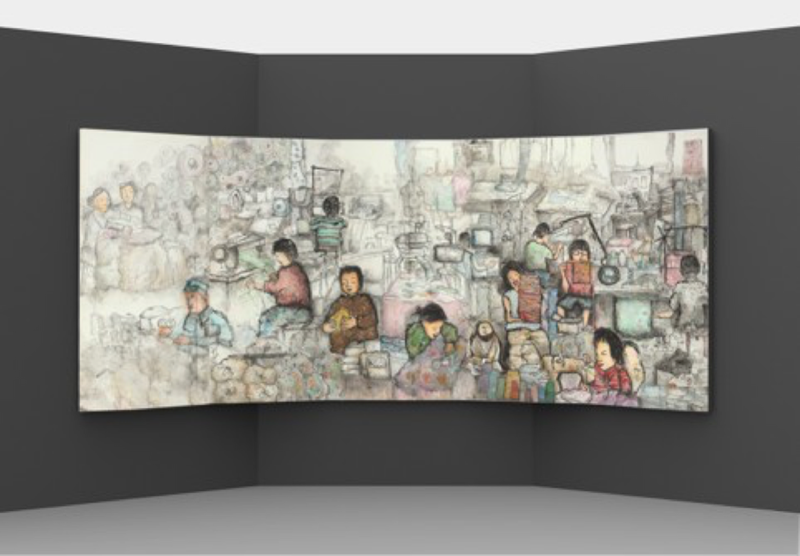 The piece was exhibited on a folding screen consisting of five panels, each panel measuring 90 centimetres wide and 150 centimetres high. The folding screen was used to evoke a small room similar to that found in a typical textile factory. The painting served as an invitation to the audience to experience a typical day in the life of a tailor in a busy, messy factory. The title of this project, "No.9, Line 73, Chenggong Road", comes from the address of the traditional textile factory where my parents used to work. Located in urban Taipei, this textile factory was also the place where I was born and raised. During the 1980s, it was common practice for Taiwanese people to set up small businesses in their own homes. Among them were my parents, who began running a clothing manufactory business from home. Instead of big, automated textile machines, the clothes were handmade by female workers in the factory, many of whom had been working there for more than twenty years when I began my project in 2007. In this painting, these women are seen to be cutting, sewing and tailoring blocks of colourful fabric in the factory. Cloth bundles, wool, yarn and sewing machines can also be seen in the factory. Using a combination of ink, colour and other materials, this painting aims to capture the bustling but warm atmosphere in the factory on paper and preserve an important part of my childhood. Lines constitute the most important element of this painting. [YX1] The people, fabric, machines and factory surroundings were drawn with multiple thin, curly brush strokes to evoke images of a factory full of wool and yarn. The brush strokes were used to create the light and shade of the subjects, whereas colours were used only to embellish the main features of the factory. As with most Chinese paintings, lines constitute the most important element of this painting. In Chinese paintings, lines should produce movements that follow a particular rhythm or melody. This rhythm in turn reflects not only the emotion of the painter but also their skill as an artist. In contrast to the Western tradition, shadow and light are secondary to lines. As the defining feature of Chinese paintings, lines are used to accentuate the characteristics of the painted subject. Lines are also the main contributor to a painting’s rhythm, imbuing the painting with its own personality. The use of plain lines allows versatility in simplicity (Reynolds, 2009). In this particular painting, the strength and vitality of each individual curly line are complemented by the density and moisture of the brush strokes. Taken together, they contribute to the busy, messy rhythm of the textile factory. Besides traditional Chinese ink, watercolour and brushes, this painting was created using various types of art paper such as Indian papers and grid papers for calligraphy. These papers were used to form a collage of sparkling buttons, assorted fabric and fantastic laces in the factory, which helped inject the painting with a vibrant, exciting character. Furthermore, this painting involved experimental techniques. For example, the bubble technique was used by mixing paint, water and soap together and blowing the mixture onto paper to achieve a distinct texture that could not be produced through hand drawing alone. Spirit resonance, or vitality, is a key feature of Chinese paintings. Referring to the overall energy of an artwork, spirit resonance reflects the nervous energy transmitted from the artist into their work (Lin, 2006). This particular piece shows a lack of regard for Western realism and body proportions. Instead, similar to traditional Chinese paintings, it leaves space for the viewer’s imagination. As an artwork, it follows the expressionistic tradition of capturing the spirit and essence of its subject rather than reproducing its physical reality. In the absence of a specific physical depiction of the textile factory, viewers are invited to focus on the spirt and mixed emotional experiences expressed through this painting. The empty space at the top part of this composition evokes the idea of infinite space, which serves to create opportunities for viewers to exercise their imagination. The factory depicted in this painting had to be shut down in 2008, a year after the completion of this project, as the business went bankrupt in the aftermath of the 2008 financial crisis. My parents have since rebuilt their factory in another location, which has been open and running since 2013. Despite having a different address and employing new tailors and dressmakers, the factory retains its warm, cosy atmosphere and continues to produce a range of quality clothing. In order to celebrate the opening of the new factory and merge this new chapter of my life with my experience at the previous factory, the next step of this project will involve a re-creation of the old painting using the same tools and materials. Then, both old and new paintings will be sliced and weaved together to form a new art work. This new painting looks set to be an exciting opportunity that would allow me to incorporate new ideas that have emerged since the completion of the previous project in 2007. Above all, it will serve as a valuable record of the factory that I grew up in - the space that first inspired me to create, and continues to shape my inspiration and values as an artist and a designer today. [YX1]Consider deleting this sentence as you mention it again a few sentences later.